Hello, quilty friends! It's Kristin S. from And Chips, here to talk to you about some of my preferred publications. 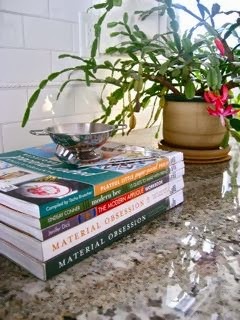 While narrowing down my list for this post about sewing, I couldn't help but expand the discussion to include cooking -- because I'm kind of a nerd like that -- and because I noticed that the sewing books I love have a lot in common with the cookbooks I adore. When selecting a title of any sort of instructional manual, I search for good illustrations, clear organization, and most-importantly they have to include projects I actually want to make or focus on skills I want to acquire. First off, I'm a big champion of book borrowing and at any given time, have three stacks of books in the sewing room and/or the kitchen. One is made up of library books, one is made up of magazines and primers borrowed (usually from mom) and then there are the growing group of books I actually own because I could not bear to keep parting with them. 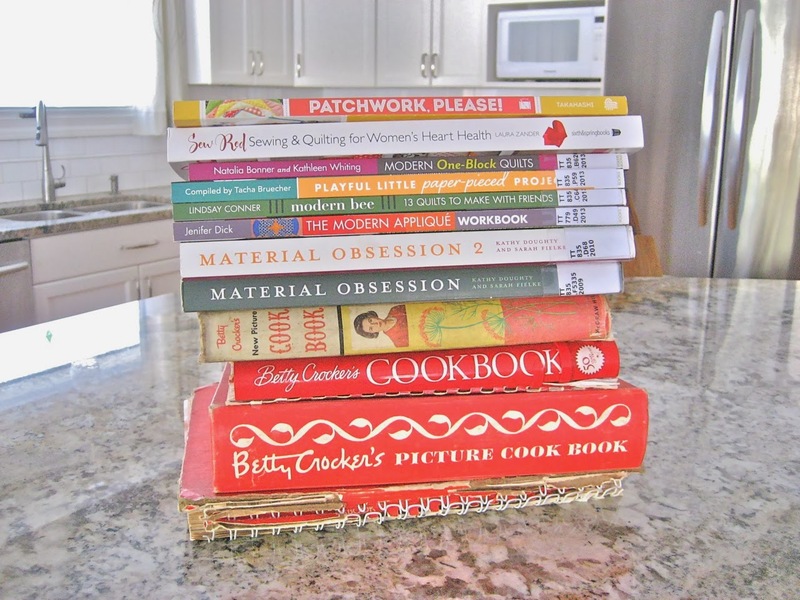 I try to only invest in books that I know I will use for the patterns/recipes. In fact, my favorite books are vetted through the borrowing process for this purpose. I screen them for usability because beyond beautiful pictures and ideas, I ask myself, do I need this book? 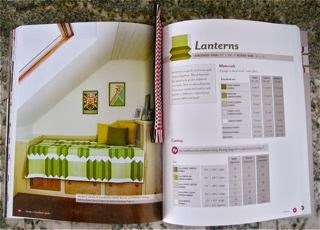 My pet peeves are pattern books not printed at full size. I hate those pages that say print at 202%. What?? Or what about templates spread across the paperback spine, making them very difficult to trace accurately. Second, I hate books that describe the construction steps with paragraphs but only show pictures of the finished project. Agh!! Last, and this is more for individual patterns but applies across the board of blogs to books too, I'm a little bothered by all the quilt patterns that are made for small throws with little information given (such as individual block size, fabric requirements, etc. so that you could enlarge them for other uses.) When I throw down my money, I want as much thorough, clear information and genius ideas as possible...and I want awesome eye candy too. The trifecta. Now, on to the list. Stash Books C&T Publishing, 2013. This book is beautiful and it's layout is cookbook perfect! Every one of the twenty-two quilts inside is constructed from a single, repeated block. Additionally, there are two or more pages of clear instructions starting with the individual block size and finished quilt dimensions. There's a little chart where the fabric math is done for you for several quilt sizes which helps you immediately estimate your project requirements. Finally, every cutting, piecing, and pressing step is clearly depicted. While instruction on quilting the finished tops isn't covered at length, care was taken to include detailed photographs of the quilting on each and every one has a different, inspiring pattern. I love this book and will definitely be asking for it for my birthday in April. 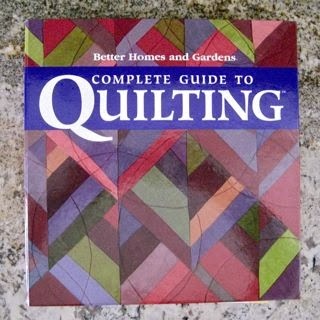 I think it's excellent, especially for beginning quilters but would make a great project book for the prolific as well because of its ease of reference. This cookbook starts with the very basics and builds from there. For a pale midwesterner, it demystified the stir-fry. 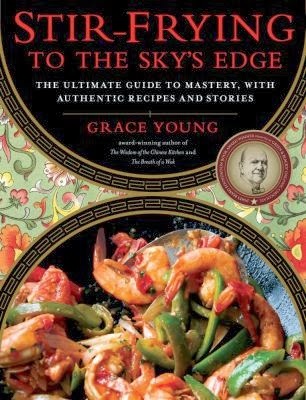 I'm talking, walking you through the wok buying and seasoning process, clear advice on cooking temperature, specifics on tools, finding ingredients, cutting ingredients... Grace Young (interview and recipes here) has eliminated the steep learning curve I've encountered with many authentic ethnic recipe books. Plus, she does tell stories; it's a book you'll want to read but still is easy to turn to at dinner time for a quick fix. I think it will be worth owning because of the breadth of information and the sheer tastiness and simplicity of the recipes. Where I live in Buffalo, our Asian restaurants all adhere to the thick-dark-sauce-and-lots-of-it rule...something I love to option out of at dinner time. Much like Modern One-Blocks above, it's a skill-builder exercise. I'm excited about it too because of the wide internet following it's developed and critical acclaim it's garnered. Still, I'm glad I checked it out first because it was a lot to take in at initial glance and because now I feel confident it will be worth having all the time. Better Homes and Gardens, 2002 (1st Edition). My very first (and only) sewing lesson with mom consisted of a ton of threading and re-threading the machine and learning to adjust tension. After that, she got me started on a nine-patch pot holder project which I made out of prints from her scrap bin. 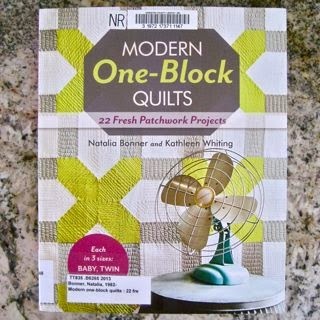 For piecing, pressing, sashing, sandwiching, quilting in-the-ditch and binding I used her copy of this all-in-one primer. 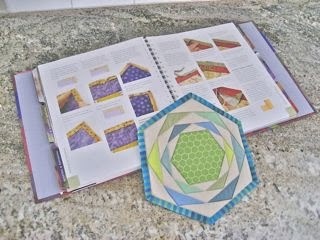 I had no idea on that day, with my little trivet, I started out leagues ahead of many quilters. I mean, I made mitered corners! It was all thanks to mom and this book. While the styles in the photos might seem a little dated, a comprehensive source of information like this one is indispensable to a hobbyist. It's true that a helpful online community serves many of us with the instruction we crave but no amount of favoriting, pinning, and bookmarking can compete with the ease of reference of an all-in-one tome, especially when the computer's out for maintenance or you're otherwise sewing off-the-grid. It can answer most if not all questions! Plus, I've found that tons of new hints and tips I've stumbled upon in the blogging world were actually covered decades ago and compiled helpfully in this book. Cook Betty Crocker's Picture Cook Book, Betty Crocker's New Picture Cookbook, Betty Crocker's Cookbook Similar to this one with some history here and value information here. Various publishing houses, editions shown are from 1950, 1961, 1978, 2001 respectively. 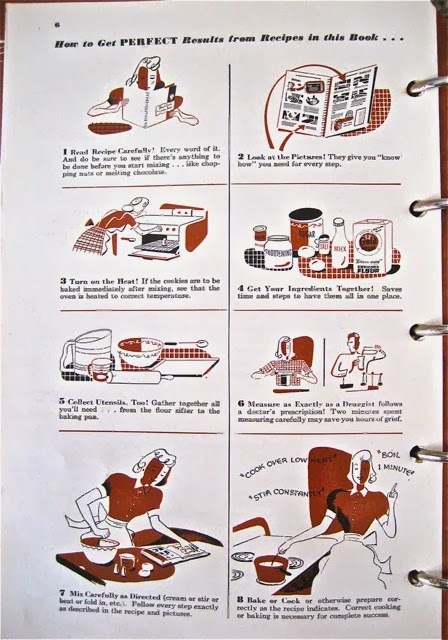 Much like the Complete Guide to Quilting above, Betty Crocker's cookbooks are indispensable primers for home cooks. You can actually teach yourself a wide skill set with one of these and they are handy for reference. Long after I've outgrown baked chicken with season salt and canned soup casseroles, the charts on cooking eggs and vegetables (from fresh, dried, canned, or frozen by bake, boil, steam or fry!) for example, never stop being handy. When I was eighteen, I became a cook for the US Army. You might grimace but I loved every minute of it. One reason was because I already knew how to read, measure, and cook from a recipe. I've never had to shy away from a new food or method because I know where to turn for the basics and it's made me confident. Sure, I learned a thing or three from professional cooks taught by professional cooks (not to mention that Army recipe cards are all written for 100 servings for easy math) but I'm not completely adrift with Betty and mom in my corner. And let's face it, a good cookie recipe never needs to be reinvented. Most of Betty's advice easily applies to quilt-making as well! Sixth & Spring Books, 2013. Are you still here? Thanks for hanging with me! I'm finally to the books I actually own. Incidentally, this is a new book for me so I haven't spilled tea all over the pages or creased the spine...yet. 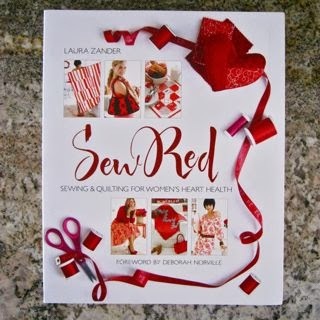 Sew Red is a compilation of sewing projects put together to help spread awareness for women's heart health. Eight of the twenty-seven projects are quilts but there are a ton of interesting ideas to sew. Plus, they're all shown in one of my favorite colors. I will say that a couple of my pet peeves are touched off by this book. The instructions are somewhat simplistic and the quilts are very small ones without tips for sizing up. What you're really getting here is a lovely collection of patterns from superstar designers like Tula Pink, Kaffe Fassett, Valori Wells, Amy Butler, Anna Maria Horner, Aneela Hooey and Denise Schmidt. That alone makes it a pretty good value compared with buying two or more of the patterns individually. Beyond that, the appeal for me is that there are some simple wearable pieces in here as well. I haven't ventured much into clothing or accessories yet but I don't want to always be quilting and not expanding my skills elsewhere. It looks like a good grab bag of gift ideas, especially for women. This is hands down, my biggest recommendation for a cook book. And it was only ten dollars. It's all about soup and little side dishes to serve with them (which I mostly ignore.) I haven't made all of the recipes but there are a dozen in here that I regularly turn to including an easy chicken noodle for sick days, a terrific black bean with layers of spices which never disappoints, and gingered carrot that makes me feel gourmet. 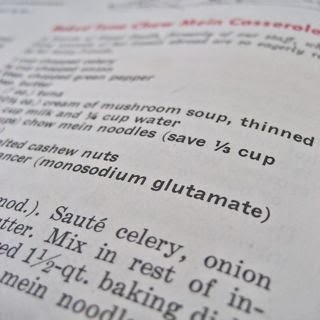 This isn't a complicated book, it often uses canned or dried ingredients and pre-made broth and noodles for ease but it wins with really nice flavor combinations and great variety. Did I mention my penchant for layout pickiness? 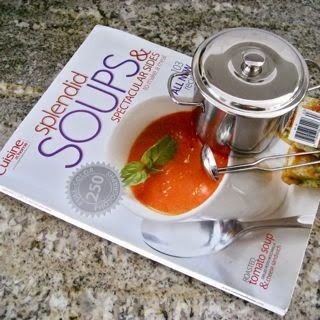 This is the perfect cookbook format. 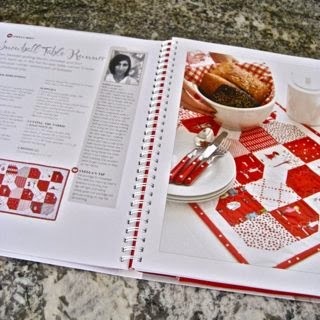 Every recipe is laid out on two pages with clear photos of both the final product as well as the steps getting there. You never have to search around for where you left off or to flip the page. And some of those side dishes I mentioned are really smart pairings like the mini spring rolls with the chicken pho ga.
That's it. You've made it to the end of this gargantuan post! 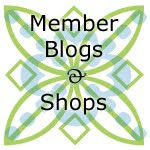 For those of you who blog: You can easily share a list of your favorite books (or sewing notions, etc.) by adding an Amazon widget to your web page. I like Amazon because of the price comparisons, reader reviews, and clear images of the covers; of course I recommend opening a concurrent tab to your library's catalogue and searching for the titles there first before you buy. Hope my list here piqued some interest. Keep stitchin' and have fun! P.S. As in most all my endeavors, mom was a big help. 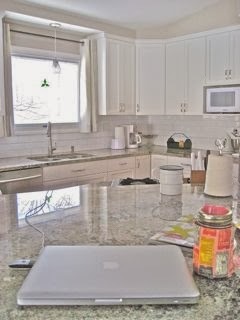 The pics are from her pretty kitchen. And she made some soup for the project but the photos didn't make it. Therefore, I think Sharon S. should be considered a contributor to this post.